This report proposes a new understanding of the dementia journey and a revised model of care for dementia, aimed at improving experiences and outcomes, and informing service redesign and commissioning. Despite improvements in recent years, quality and outcomes are still falling behind increasingly high expectations of the public and people living with dementia. Evidence suggests that applying a systematic approach to service models and delivery might contribute to better outcomes. incorporating evidence of good practice, policy and relevant literature. A number of themes emerged time and again, leading to a re-think about dementia and the people who live with it. 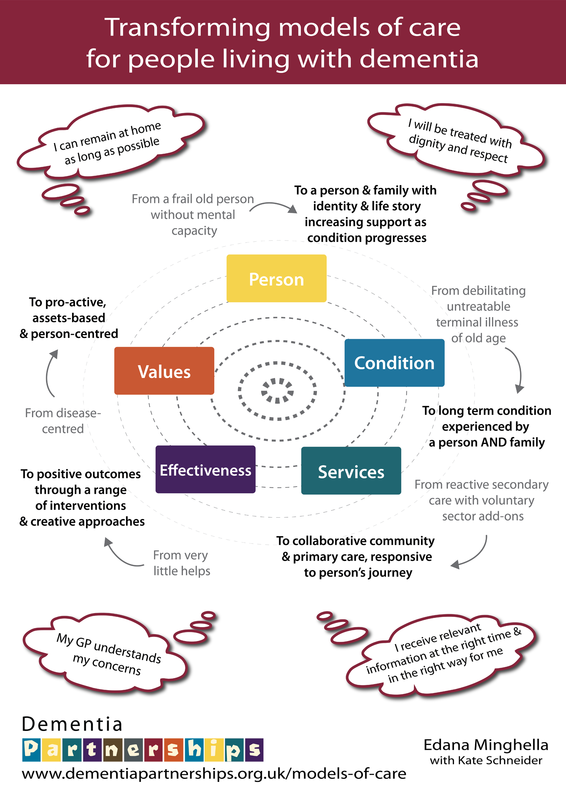 This, in turn, has led to the proposal of a new understanding of the dementia journey and a revised model of care for dementia, aimed at improving experiences and outcomes, and informing service redesign and commissioning. the nature of a condition or disorder – e.g. what is its course, what effects does it have, is it debilitating, does it affect mind and/or body? the person living with that disorder (in this case, dementia) – e.g. are they fundamentally changed by the disorder, do we conceptualise them as individuals or part of a system, do they have capacity to make decisions? service aims and type of provision – e.g. should it provide treatment, advice, hospital or home-based care? evidence or consensus around the effectiveness of treatment and interventions – e.g. what helps to prevent and manage problematic behaviours?